Andromeda is a lovely Greek restaurant located close to Lourdas Bay, on the southern side of Kefalonia. 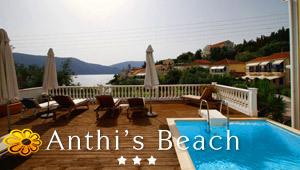 The restaurant is located off the main road to Skala and is quite easy to find. The outside seats of the restaurant provide a great view of the beautiful bay and the mountainside. This is a favorite place of the visitors as they can enjoy the Greek delicacies. The food served is fresh and well cooked with locally grown products. The restaurant can also host special occasions, like weddings and anniversaries. The food is excellent and so are the wines. The desserts are delicious mixed up with fruits and nuts. Some of the blends give exotic taste beyond imagination. Some nights, there is Greek music and dancing.